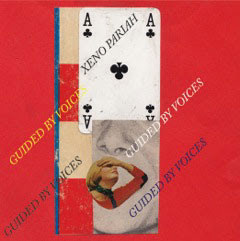 The 4th of five singles, released every two weeks starting in February 2013, leading to the release of the 4th GBV reunion LP English Little League. Contains one exclusive b-side. Xeno Pariah: reviewed under the English Little League LP. Little Jimmy the Giant ('83 version)- 3 The official title for this is simply "Little Jimmy the Giant." However, it was originally released as a different version on the first Suitcase box-set in back in 2000 as "Little Jimmy the Giant." Originally, the song was recorded in 1975!!! Both versions are decent, and nothing to drool over. This one sounds more like a three chord-garage-rock, cheesy TV theme song. Enjoy this 30th anniversary edition of it on this limited 7'', and if nothing else it will serve as an intriguing history trip for GBV fans.